It has now been a full year of owning goats. Our first two goats came in February, 2013. They were both papered Nigerian Dwarves, Daisy and Saraphine. We bought them for milk and meat. The milking didn’t go so well. I describe it all here. Then I got an email from the lady who sold us the goats wondering if I wanted another one for free. She was Nubian/Boer and currently in milk. She was free because she had foot problems during her last pregnancy and couldn’t have babies again. Two weeks later we brought home Ochee and Avery. Ochee was free and we bought Avery who was a Oberhasli/Alpine. 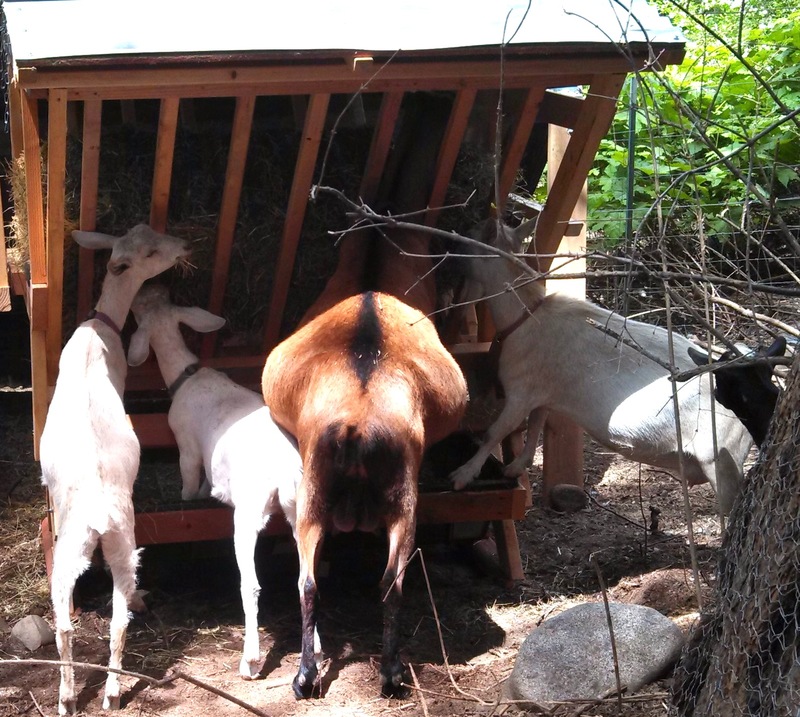 My idea was to raise the Nigerian Dwarf goats to sell and use the larger goats for milk. By the end of March we had added two more goats. 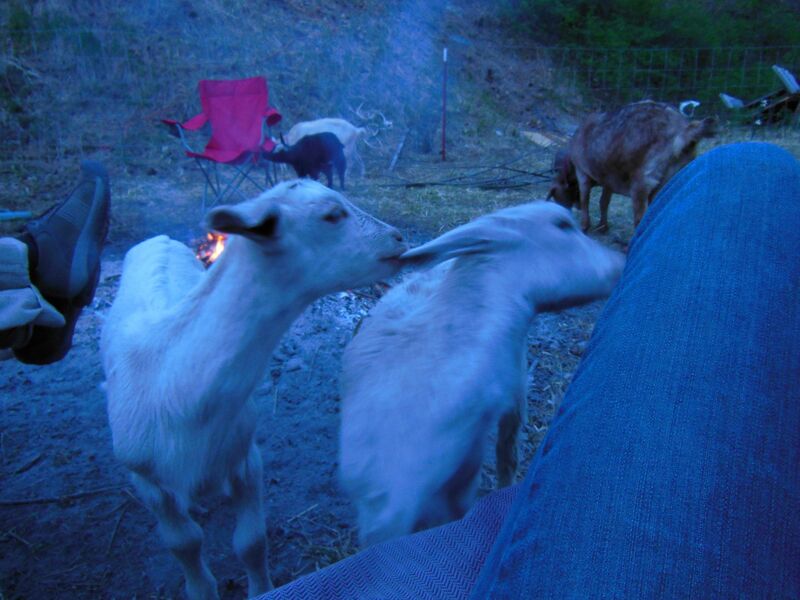 These two were Nubian/Saanen and we named them Piper and Nina. They were bottle babies at the time. What an adventure we had getting them! You can read about it here. So, that brought the total to 6. Having 6 goats made perfect sense to me. Three full sized dairy goats to stretch out the milking season and provide lots of milk for cheese, yogurt and ice cream. Two for breeding and well, once Ochee was done milking, she’d have to go. It didn’t make sense to him to feed that many goats just to get 1/2 gallon of milk a day. Ahhhh, yes, well, I saw his point. So, we decided to sell some goats. It wasn’t too hard deciding which ones to keep. We loved our two bottle babies. They followed us around everywhere, came when they were called and tried to sit in our laps while we hung around our outdoor firepit. We were far more attached to them than the others. And, to be honest, the Nigerians that we had downright annoyed me. Daisy was not friendly at all and Saraphine had was always escaping. She also had the LOUDEST baaaaa. I always felt like she was yelling at me. It took a couple months and then we had a peaceful farm with just two goats. Oh, and two sheep :). Did I forget to mention that I had ordered two ewe lambs in April? He he. Well, we brought them home in September the day after finally selling Daisy and Saraphine. 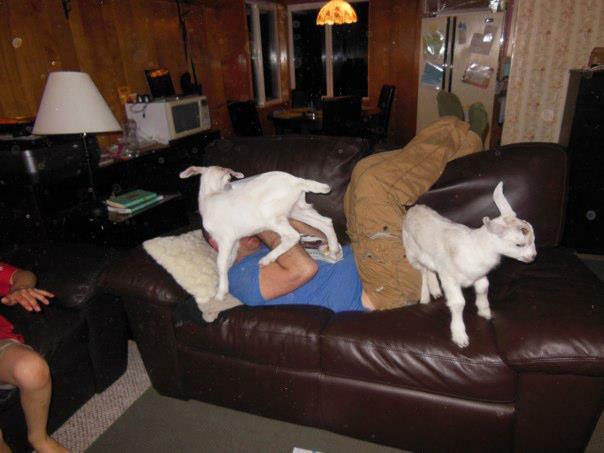 But, this post is about goats…so, yeah…it’s MUCH better with just two goats! This entry was posted in Goats, Happenings and tagged dairy goats, how many goats do you need, Nigerian Dwarf. Bookmark the permalink.